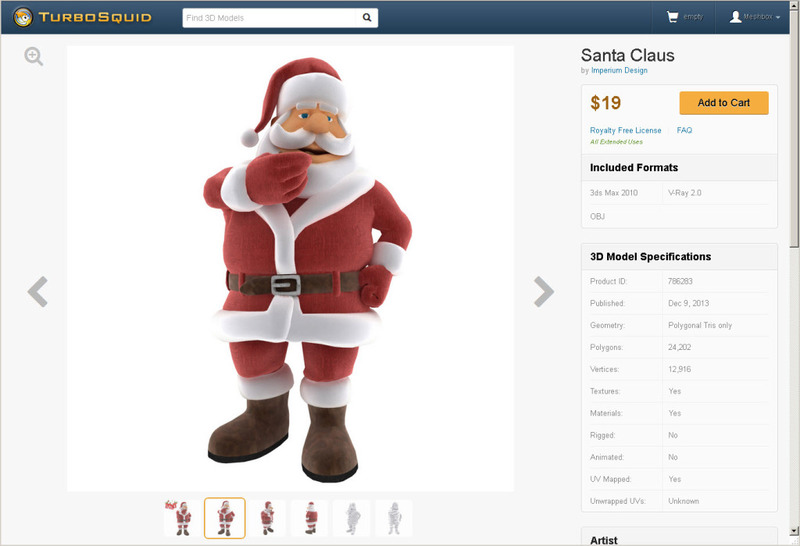 A scumbag going by the name of Imperium Design has ripped off our Toon Santa character and has begun selling it on Turbosquid. We’ve reported it to Turbosquid as of 1:30 PM Sunday December 7, 2014. Lets see how long it takes for them to remove it. Why am I posting about this? You can see its been here since last year. TS like other brokerages have a product review process for quality. But they do not make any effort to see if a product is authorized or not. Will TS refund customers their money and tell them that they cannot use Toon Santa? Will TS remove the scumbag’s account? Looks like some movement! We checked at 9 AM this morning, and now using the old link seems to parse to a new URL. No reply yet from Turbosquid directly. Pursuant to the Digital Millennium Copyright Act (“DMCA”), TurboSquid will disable the product immediately and notify the seller of your claim. However, the product is still visible on their site as of 7:40 AM. We also request you provide to us contact information of users who purchased the product from your site, and that you terminate the vendor account of Imperium Design. Nine hours later (10:35 PM PST, December 7, 2014) no reply yet from Turbosquid. Not surprising since its Sunday. We tried contacting Turbosquid using their 24/7 chat feature. Nobody ever came on to chat. Lets see where we are on Monday. Man, nothing is safe. Nothing I hate more than others taking your hard work and then profiting from it, what goes around comes around! Thanks Sharen! And look, yet another one on TS did it! Sorry this has happened to you . You’re work has been well known for many years, it’s really strange that another 3d site wouldn’t have heard of you or seen your work. Integrity , scruples and morals is all there really is to anyone . If they lose that then they are nothing . Hopefully TurboSquid will inform those that purchased from their site and refund them, but most importantly make an apology to you or retribution. The best of wishes to you. We’ve licensed models on Turbosquid before ourselves; I can’t say we benefited from it. Over the years, I have noticed a number of obvious copies – models of Batman and the Hulk, for example. So far, their only response is to respond to the DMCA takedown notice. I really wonder though if brokerages that review and post products on behalf of users really can get protection under DMCA.